The B2BGateway application is recognized as an "Acumatica-Certified Application" for version 2018 R1 by the Cloud ERP Company. B2BGateway completed a customized Acumatica integration between Integra Optics and Tech Data in one week. Cloud based, fully integrated EDI solution provider celebrates 15th anniversary partnership with NetSuite. The Pro To Know Awards recognize supply chain executives, and manufacturing and non-manufacturing enterprises, that are leading initiatives to help prepare their companies’ supply chain for the significant challenges of today’s business climate. Cloud based, fully integrated EDI solution provider to be Gold Sponsor at MYOB United for Growth Conference 2017 in the Barossa Valley. Combined EDI and Channel Management Solutions provide Amazon Vendors achieve top sales potential and supply chain efficiencies. EDI solution provider and 3PF combine solutions to help merchants conquer the Omni-channel. B2BGateway, a leading global EDI solution provider and Acumatica certified partner, announced today that it will be a gold sponsor of Acumatica Summit 2017. The B2BGateway EDI application will allow MYOB Advanced users to eradicate the need to re-key data when exchanging business documents with their trading partners. B2BGateway, a global EDI solution provider, and DSI, the global digital supply chain platform company, announced today a partnership to deliver seamless supply chain solutions to end users in the manufacturing and wholesale distribution sectors. B2BGateway’s EDI Connect App shortlisted as a Finalist in the Technology section of the UK Logistics & Supply Chain Excellence Awards. Global QuickBooks Online EDI Partner To Sponsor QB Connect in San Jose, CA. Global NetSuite EDI Partner to Sponsor & Exhibit at SuiteConnect EMEA. Rapid global growth in pharma packaging industry prompts leading supplier Legacy Pharmaceutical Packaging to further automate their supply chain processes thru cloud based EDI technology. Global NetSuite EDI Partner to Sponsor & Exhibit at SuiteConnect Australia. Cloud based, fully integrated EDI solutions for Xero users. B2BGateway and Exact solution provider Elementary Solutions helps improve the bottom line for UK users of Exact cloud software by improving the synergy between their processes, people and technology through Exact. B2BGateway EDI Encourages the Use of Pencil and Paper! Iconic baby stroller company uses newly developed B2BGateway EDI Connect App to manage all customer accounts with back-end NetSuite ERP while on the go! B2BGateway, a leading global EDI solution provider, announced today at Scaling New Heights fully integrated EDI solutions for QuickBooks Online, Exact Online and Xero accounting software end users. EDI Connect App allows B2BGateway clients to manage their EDI accounts while on the move. One of New Zealand’s fastest growing breweries implements B2BGateway’s EDI solution for their MYOB Advanced ERP system to establish seamless communications with their 3PL. South Florida-Based Internet Marketing Company Partners with Global Dedicated EDI Service Provider. B2BGateway Executives honored by Supply & Demand Chain Executive Pros to Know Awards. The Pros to Know Awards recognize supply chain executives, and manufacturing and non-manufacturing enterprises, that are leading initiatives to help prepare their companies’ supply chains for the significant challenges of today’s business climate. Company built upon gamer’s dreams implements international EDI provider’s solution to integrate with ERP system and exchange business documents electronically with trading partners. B2BGateway’s cloud based, fully integrated EDI solution for Xero users allows MaxRelief to reduce reliance on paper and greatly increase labor efficiencies when communicating with their supply chain partners. WMSSoft, an MYOB Enterprise partner and B2BGateway, a world recognized EDI solution provider, today announced a partnership to provide cloud-based, fully-integrated Inventory Management and EDI solutions to users of MYOB Advanced. Kilimanjaro Consulting, the leading provider of MYOB’s enterprise level business software systems in Australia and B2BGateway, a world recognized EDI solution provider, today announced a partnership to provide cloud-based, fully-integrated EDI and automated supply chain solutions to clients of Kilimanjaro Consulting using MYOB’s new cloud based ERP solution – MYOB Advanced. B2BGateway, a leading global EDI solution provider today announced that it has developed a cloud-based, fully integrated EDI solution for users of Exact Online business software. Fronde the leading provider of cloud technology services in Australia and New Zealand and B2BGateway, a world recognized EDI solution provider, today announced a partnership to provide cloud-based, fully-integrated EDI and automated supply chain solutions to clients of Fronde using NetSuite ERP. Rhode Island company record tremendous growth over past 3 years. Fully integrated EDI solutions now available to Freestyle Commerce clients. B2BGateway, a leading global, cloud based EDI solution provider has opened a new office in Sydney, Australia to further enhance its EDI and automated supply chain solutions in the Pacific-Asian region. B2BGateway, a leading global, cloud-based EDI solution provider has been recognized as a ‘Top 20 Most Promising Logistics Solution Provider’ by CIO Review Magazine. Leading EDI provider supports clients by meeting the ever-changing EDI requirements. Planet Dog, a leading manufacturer of socially-responsible, values-based dog products, has partnered with B2BGateway to fully-integrate with their NetSuite ERP system. The leading supply chain publication and industry expert, Supply & Demand Chain Executive Magazine, has named B2BGasteway CEO, Kevin Hoyle as a Supply Chain ‘Pro to Know’ for 2015. When major retailers such as Costco and UNFI approached Three Twins Organics to distribute their product nationally, the organic ice cream manufacturer enlisted the help of B2BGateway to meet the EDI needs of the retailers. B2BGateway a leading Intuit QuickBooks Gold Developer today announced that it has developed a new App to enable QuickBooks Online users to communicate seamlessly with their trading partners thru EDI technology. Soup giant implements international EDI provider’s solution to integrate with ERP system and transmit business documents electronically to trading partners. RT Nash enlists the help of long-time EDI partner, B2BGateway, to migrate from big dollar ERP system to Brightpearl with all the functionality at a fraction of the cost. Leading EDI provider and logistics firm supports clients by meeting the ever-changing retail requirements. B2BGateway now offers fully-integrated EDI solutions to all QuickBooks Online users. Global EDI solutions provider, B2BGateway, has just rolled out new and improved Warehouse Support Site (WSS) to new customers and existing clients. B2BGateway enlists the help of 360 Cloud Solutions to offer clients the full spectrum of purely cloud-based NetSuite solutions and add-ons. B2BGateway will have a booth at this year's Intacct Advantage, Customer and Partner Conference, October 21-25 at the M Resort in Las Vegas, Nevada. The 'Built for NetSuite' program is designed to give NetSuite customers additional confidence that SuiteApps have been built to meet these standards. Vitasoy USA, Inc. chooses leading EDI solutions provider B2BGateway to connect with 35 retailers nationwide. B2BGateway partners with strategic management consulting powerhouse, Blytheco, to deliver fully-integrated EDI solutions to NetSuite clients. Premium wool clothing company selects B2BGateway fully-integrated, cloud-based EDI solution to trade with retailers nationwide. B2BGateway, the leading Global EDI solution provider, today announced a strategic partnership with Intacct, a leading provider of cloud financial management and accounting software, to deliver fully integrated, cloud based EDI solutions to Intacct users. Fosdick Fulfillment teams up with B2BGatewayto deliver automated, cloud-based warehouse solutions to clients. Since the inception of the relationship in early 2011, B2BGateway and Fosdick have enabled thousands of orders to be shipped without any manual data entry. B2BGateway to demonstrate 200Connect EDI solution at Sage Evolve Business Partner Conference. Greenleaf Book Group joins the ranks of B2BGateway’s many successful NetSuite clients to trade EDI documents with giant wholesale outlets such as Baker & Taylor, American Wholesale Book Company and Ingram Book Company. Fully-integrated EDI solutions provider and long-time Intuit consultants join forces to deliver a full range of custom products to Intuit users. Leading NetSuite consultants, Aminian Business Services, team up with B2BGateway to offer a diversified lineup of NetSuite ERP solutions. B2BGateway rolls out new EDI solution, 100Connect for Sage 100 ERP in time for the 2012 Sage Summit in Nashville, Tennessee. B2BGateway and BCG Systems, Inc. announce NetSuite EDI partnership. B2BGateway partners with Camelot 3PL Software to bridge information gap. B2BGateway shortlisted as finalist in Supply Chain Excellence Awards 2012. InCase Designs enlists the help of B2BGateway to trade electronic documents with Apple, Best Buy, Bloomingdales and Saks amongst others. InCase Designs enlists the help of B2BGateway to trade electronic documents with Apple, Best Buy, Bloomingdales and Sak's amongst others. B2BGateway to exhibit at the GS1 Ireland Supply Chain conference in the Convention Centre Dublin, Friday 27th April, 2012. Have lunch on B2BGateway at the CDC Ross Enterprise SIG User Conference. B2BGateway will be sponsoring lunch on Monday May 14, 2012 at the CDC Ross Enterprise SIG conference. This year’s CDC Ross Enterprise SIG User Conference will take place at the Hotel Monteleone in New Orleans, LA, May 14-17, 2012. B2BGateway and 3dcart Combine Forces to Provide Clients with the Most Robust, User-Friendly eCommerce Platform on the Market. B2BGateway hits 600lb Gorillas sweet tooth! B2BGateway to attend NetSuites SuiteWorld conference in San Francisco, May 14-17 2012. B2BGateway to attend NetSuite's SuiteWorld conference in San Francisco, May 14-17 2012. B2BGateway to partner with NPS and OPW in Irish Government e-Invoice pilot project. B2BGateway to partner with the National Procurement Service (NPS) and Office of Public Works (OPW) in Irish Government e-Invoice pilot project. B2BGateway.Net attributes this substantial growth to increased consumer confidence, the extended shopping period associated with online eCommerce sites and the large number of new clients who outsourced their EDI requirements to B2BGateway.Net throughout 2012. Sage Peachtree turns 50 this year! What do B2BGateway and the Commodore 64 Have in common? B2BGateway to attend the NRF's "Retail's BIG Show" in New York. Doorscapes, Inc. chooses B2BGateway's WebConnect EDI to trade with Ace Hardware and Do It Best. B2BGateway.Net will be attending the 2012 International CES in Las Vegas from January 9th to 13th, 2012. B2BGateway.Net brings EDI to the Cloud! Although we at B2BGateway.Net didn’t invent cloud computing, we were a very early adapter starting our cloud based EDI services in 1999. B2BGateway.Net to attend the Intuit Connections ISP Summit 2011 in Orlando, Florida, October 9-12. 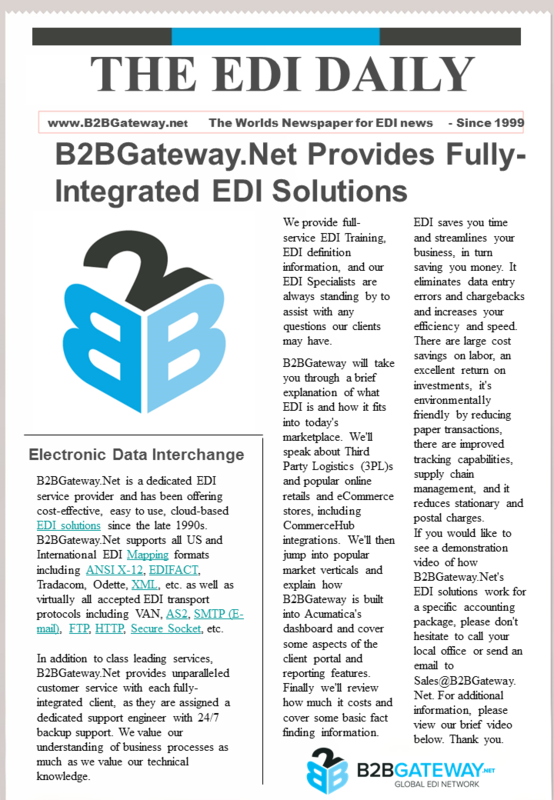 B2BGateway.Net - not just another EDI solution provider! Since 1999 B2BGateway.Net has been recognized as a world leader in the provision of Cloud\SaaS based EDI solutions to thousands of clients and trading partners in over thirty countries worldwideer! B2BGateway.Net CEO, Kevin Hoyle, to be featured speaker at Right Networks Accounting C4 conference in Boston, September 18th to 20th, 2011. B2BGateway.Net CEO, Kevin Hoyle, will be a featured speaker at Right Networks Accounting C4 conference. This year’s conference will take place at the Renaissance Boston Waterfront Hotel from September 18th to 20th, 2011. The group gives a platform to B2BGateway.Net's clients, partners and associates to exchange ideas, solutions and experiences in relation to EDI and associated Data Integration tools such as Vendor Managed Inventory (VMI), Scan Based Trading (SBT), Warehouse Support Sites (WSS), Supplier Portals and EDI Testing & Validation Solutions. B2BGateway NetConnect is a SuiteApp that lets users exchange documents through any standard EDI or communications protocols. B2BGateway.Net is giving all NetSuite VARs, Partners and Consultants the opportunity to win a fantastic, all inclusive, weeks vacation for two in the Caribbean this coming winter. B2BGateway.Net will also be attending SuiteWorld, NetSuite’s first User and Partner Conference which takes place in San Francisco from May 8th to May 12th, 2011. B2BGateway's cloud based, fully integrated EDI solutions for Acumatica were chosen by award winning computer case and cooling supplier NZXT to communicate seamlessly and electronically with customers such as Amazon and Best Buy. B2BGateway.Net EDI solutions convert 830 Forecast Schedule Documents to 850 Purchase Orders for suppliers of the Automobile Industry. B2BGateway.Net records 32% growth during Holiday Season 2010. Due to continued expansion in the EU, B2BGateway.Net is moving its European Headquarters to the new Westpark Business Campus at Shannon, Ireland. B2BGateway.Net will be exhibiting at Sage Visions 2010 at the Concept Centre, Millbrook, United Kingdom on Wednesday 3rd November. B2BGateway.Net will be attending the Intuit ISP Summit 2010 4th to 7th October at the Hyatt Regency Century Plaza Hotel, Los Angeles. B2BGateway.Net delivers quality EDI solutions to all Sage UK products, including Sage 50, Sage 200 and Sage 1000. B2BGateway.Net attend Mamut Partner Conference UK. B2BGateway.Net is the preferred EDI solution provider for all Mamut Business Software. B2BGateway.Net is delighted to announce that we are now in a position to offer outsourced EDI Testing and Validation Services. B2BGateway Ltd Appoints Director of European Sales and Marketing. B2BGateway Ltd. (the European arm of Global EDI Specialist B2BGateway.Net), is proud to announce that it has appointed Roger Leyden as Director of European Sales & Marketing. B2BGateway.Net attends NetSuite Cloud 2010 Partner and Developer Conference. B2BGateway representatives were on hand to educate attendees on the importance of utilizing B2BGateway EDI to achieve their profitability goals in 2010 and beyond. B2BGateway, a world-leading vendor of Software as a Service (SaaS) EDI Solutions, today announced executive participation in the CDC Software, Ross Enterprise SIG Conference, held in Atlanta, Georgia. B2BGateway and Online One partner to serve EDI customers Worldwide. B2BGateway (a product of Shannon Systems LLC), an integration solution partner of NetSuite, MYOB, QuickBooks, PeachTree, Ross, Interprise Suite and various other software packages, has partnered with Online One in Sydney, Australia. B2BGateway and LeSaint Logistics partner to provide Supply Chain and EDI solutions. Full service supply chain and EDI collaborative solutions are achieved through the partnership of world leading EDI provider B2BGateway and Top 100 3PL LeSaint Logistics. Kevin H. Hoyle, CEO of Shannon Systems, a software company in Brockton, Mass., stands in the company’s temporary offices in Richmond. Shannon is building a new headquarters in Hopkinton. B2BGateway, the World's Leading Software as a Service (SaaS) Electronic Data Interchange (EDI) Solution, Expands Operations to Better Serve European Clients. B2BGateway’s new Client Portal allows NetSuite users to easily manage and connect to any Electronic Data Interchange (EDI) Trading Partners. NetLedger, Inc., makers of Oracle(R) Small Business Suite, today announced integration partnerships with leading vertical industry software providers targeting markets including biotech, agriculture, residential sales and construction, document management, and electronic data interchange (EDI).